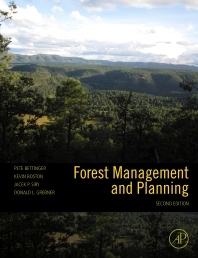 Forest Management and Planning, Second Edition, addresses contemporary forest management planning issues, providing a concise, focused resource for those in forest management. The book is intermixed with chapters that concentrate on quantitative subjects, such as economics and linear programming, and qualitative chapters that provide discussions of important aspects of natural resource management, such as sustainability. Expanded coverage includes a case study of a closed canopy, uneven-aged forest, new forest plans from South America and Oceania, and a new chapter on scenario planning and climate change adaptation. Pete Bettinger is a professor of forestry at the University of Georgia. He teaches forest planning, forest measurements, and aerial photogrammetry; and conducts research in applied forest management with particular emphasis on harvest scheduling, precision forestry, and geospatial technologies. Dr. Bettinger has worked with the forest industry in the southern and western United States, and maintains this connection to forestry professionals through his leadership in the Southern Forestry and Natural Resource Management GIS Conference and other continuing education courses he offers. Dr. Bettinger is also a co-author of two other books published by Academic Press, Introduction to Forestry and Natural Resources, and Forest Plans of North America. Kevin Boston an associate professor at Oregon State University. He has held academic and professional positions in both New Zealand and United States. He is a registered professional forester in California and licensed logging engineer in Oregon. His research area are in forest planning, forest transportation, and forest policy. Jacek Siry is a professor of forest economics at the University of Georgia. He teaches forest economics, economics of renewable resources, and international forest business, and conducts research in applied forest economics with emphasis on timber markets, investments and finance, and forest management. Dr. Siry is also a co-author of two other books published by Academic Press, Introduction to Forestry and Natural Resources, and Forest Plans of North America. Dr. Donald L. Grebner is a professor in the Department of Forestry, Mississippi State University. His areas of research specialization include forest management and economics, bioenergy, carbon sequestration, and forest protection. He teaches undergraduate and graduate courses, both traditional and distance, in forest resource management, advanced forest management, and international forest resources and trade. Prior to his time at Mississippi State, he worked as an extension forester with the U.S. Peace Corps in Costa Rica and was a research analyst for Winrock International. He is very active in the Society of American Foresters as well as the International Union of Forest Research Organizations, Unit 4.02.00 Accounting and Managerial Economics Working Group. Dr. Grebner is a co-author of three textbooks entitled Forest Management and Planning, Introduction to Forestry and Natural Resources, and Forest Plans of North America.